As an admitted fitness buff, I always look forward to yearly Mr Olympia competitions…and especially the related events. They’re a massive convergence of like-minded individuals with a culture all their own. And for a few days a year, Las Vegas is one big fitness retreat. The extended weekend is packed like an overstuffed gym bag, with thousands of physique, bodybuilding, fitness and modeling enthusiasts competing, teaching, inspiring….and selling lots of products. Each year is bigger and better, and in 2015 I was right smack dab in the heart of it, representing the press for the first time. 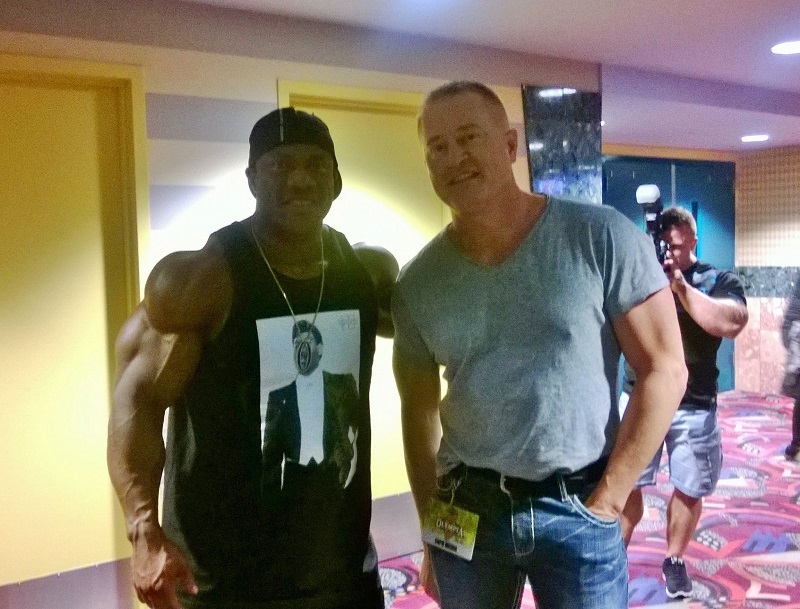 It should be mentioned how tough it is to get official media credentials for Mr. Olympia access and coverage. It’s an arduous and time-consuming procedure (three years of applying until finally getting my first approval). Being a fledgling site made getting credentials even more difficult, so it was an honor to attend alongside the “big-boy” media outlets of the world. It also didn’t hurt that one of my photos was used in a two-page spread for the December 2013 Mr. Olympia issue of FLEX Magazine (toot toot!). But, I digress. After picking up my official press kit and badge at Orleans Casino (the host hotel), it was off to Brendan Theaters inside The Palms. This was for the world premiere of the docu-drama The Perfect Physique. Once again, I was lucky to be one of only five media outlets to photograph the official red carpet proceedings and the only member of the press to party with the cast and director afterward. It’s doubtful that Ghostbar at The Palms ever hosted such an eye-catching crowd before (present company excluded). The Perfect Physique is this generation’s answer to Pumping Iron. It explores the lives of fitness/physique competitors, misconceptions of being “shallow” and what drives these athletes to dedicate every moment of their existence to their bodies. It’s also dedicated to fitness superstar Greg Plitt, who was tragically killed in an unrelated photo shoot after filming was completed. The movie is emotional, raw, revealing, unexpectedly uplifting and often quite funny. It’s directed by prodigy Kandice King, who produced her first film at 18 years of age. The Perfect Physique was screened in major metro areas with the cast and director via a modified roadshow theatrical release. It is now available for streaming on Netflix., and I was honored to have a quote from this article posted on the DVD/blu-ray boxes. 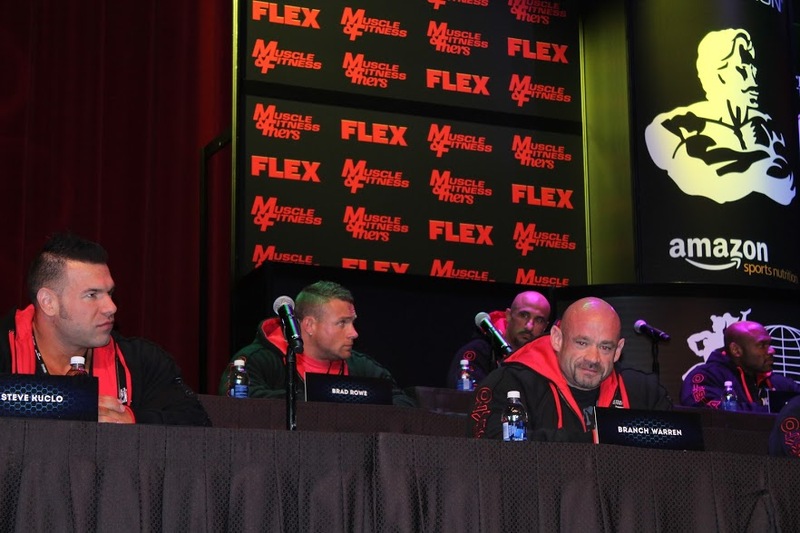 The following morning was the launch of official Mr. Olympia proceedings, with a press conference featuring all qualifying competitors for the main event on Saturday night. Much like the theatrical match-ups before boxing and pro wrestling matches, the Olympia press conference is a lot of bravado, self-praise and rah-rah to get the audience pumped up. It’s always free to the public, and the Orleans Theater was packed to the max. My favorite part of the weekend is always the Fitness Expo at Las Vegas Convention Center. Held Friday and Saturday from 10am to 5pm, it’s an all-out festival of fitness stars, products, demonstrations and competitions. It really has to be seen to be believed. For those who don’t follow Mr. Olympia, Seattle native Phillip Heath was going for his fifth consecutive win. His nemesis Kai Greene did not enter, and depending on the source you believe, was either banned from competing or refused to sign his contract to compete. At the end of the night, Heath won his fifth trophy and a $400,00.00 prize. As usual, he and his entourage would party the night away at Wynn/Encore’s XS Nightclub. And Heath would return again in 2016 for crown number six. I, like always, will be back this year to give you all the details when Phil Heath goes for trophy number eight. Don’t miss out…order your tickets now. This year’s Mr. Olympia Competition and Fitness Expo weekend runs September 13th through the 16th. Tickets, schedules and information are available by clicking here.